The New Humanitarian | IRIN Interview with Hassan Mohamed Nur "Shatigadud"
IRIN Interview with Hassan Mohamed Nur "Shatigadud"
IRIN interviewed Colonel Hassan Mohamed Nur "Shatigadud", chairman of the Rahanwein Resistance Army (RRA) and leader of the Digil and Mirifle clans, at the Ghion Hotel in Addis Ababa. "Shatigadud" (Red Shirt) is a former Somali army colonel who worked as a member of the former National Security Service (NSS) and has his power base in Baidoa. Formerly a supporter of Somalia's Transitional National Government (TNG) and a member of the transitional parliament, he withdrew his backing and went to Ethiopia. 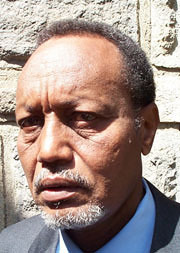 He is now a co-chairman of the opposition Somali Reconciliation and Restoration Council (SRRC). He talks about his movement, and his relations with the TNG and Ethiopia. QUESTION: Why was the Rahanwein Resistance Army set up? ANSWER: The RRA is in a different position from other Somalis because the RRA is a community that has some differences based on culture. It is different from the other main clans. The Digil/ Mirifle land has been invaded and the people subjugated. First it was the former president who was mistreating the people and when he was ousted he established a militia in Baidoa and stopped the aid coming into that area. The people of Baidoa were dying of starvation, hundreds per day. It was called City of the Dead at that time – in 1993. After this suffering General Aideed [Hussein Aideed’s father] set up the so-called broad-based government and to recruit militia he captured Baidoa in 1995 and that is when we set up the RRA. First I was a commander then a chairman in 1997. When he [Aideed senior] died, Hussein stayed in Baidoa and we ousted him. Now we are friends – relatively. There was a bloody battle on 6 June 1999 with about 800 people killed. For us that was a day of victory. Q: You were a member of parliament with the Transitional National Assembly (TNA). Why did you quit? refused to reconcile the clans. They sought only to form a government without reconciliation, but this is essential. In 1992/3 we lost more than 300,000 people and we should be compensated. Before the establishment of any government we want to know that the people who are responsible for the destruction of our country are to be punished. They never said to us sorry. Where are our people who have died? Who was responsible? Nobody will talk about that. The SRRC [the Somali Reconciliation and Restoration Council] has agreed that compensation is paid. We have not agreed how much. Somalis talk about government but we have these differences. Q: What exactly are you fighting for and what do you want? A: We want Somalia to adopt a federal system. To achieve this goal what I think is that Somalia should be built from the ground. Not from the top down. We have first to build regional authorities. Also, our clan is ill treated by other clans. For 30 years the other Somalis have marginalised them. They didn’t get their rights, the chance to rule the country. They were even prevented from getting big positions. All of the main clans have power within the TNG. The Digil/Mirifle has nothing. We are the real opposition and prepared to carry on fighting until we are represented. I don’t want any specific role, I want real power sharing among the people. If there was a vote and I was elected I would take that role. I might get something in a government because I have my people. I cannot say whether I would be president or prime minister because that depends on the people. Q: Why should the RRA be taken seriously as a political rather than a military force? A: We are the balance of power. If someone from the Darod clan wants to be president they must get votes from us. Whoever gains power has to get the votes from Digil/Mirifle. If Darod doesn’t want to give his votes to Hawiye and Hawiye doesn’t want to give his votes to Darod then we are the balance. Q: Would you talk to the TNG now? A: Some members have called me to talk, but not seriously. They called me and said come and we will give you a position in the government, but what I am fighting for is not for a position but for a principle. They don’t want to address the issue of withdrawal from the lands occupied by force, to change the constitution, they don’t want to talk about the serious matters, they only talk about money, bribes and position. Q: Would you give up your weapons for peace and what would it take? A: Under my command now we have 4,000 militia. These are trained – the regular army. We have 40 technicals [armed vehicles] and weapons. We are the military muscle of the SRRC. We would lay down our weapons for peace. The occupied land of the Digil/Mirifle would have to be freed by the TNG forces – they are controlling some of our land and we want them out. If they withdrew I would be happy with the TNG. There will be peace if it is handled properly. First we have to have a proper national reconciliation and complete disarmament of all clans under the international community. The international community can help by intervening to help disarm, and second to help with SRRC because we are not terrorists like the fundamentalists. The TNG are mixing politics and religion. Q: What exactly are you doing in Ethiopia and how has the Ethiopian government helped you? A: We are here to get some assistance from the international community and have seen diplomats while we have been in Ethiopia: Chinese, Italy, America, Germany, Sudan and Yemen. For a long time Ethiopia was helping most of the factions in Somalia including those claiming to be the TNG. Sometimes we have had military and financial support from Ethiopia but not recently, nothing since the Djibouti conference in October 2000. Q: How long will the fighting go on in Somalia? more manpower and militia. As a faction, the RRA is the most powerful because our militia control while the other militias are not under control. We are a very trained force.